Ann Mei Chang is the Executive Director of Lean Impact, the social good division of the Lean Startup Company. This fall, her book based her own experiences using lean approaches to innovate in the social sector, including during her time at USAID, as well as stories from nonprofits, social enterprises, companies, government agencies, foundations, and philanthropists all over the world, will be published. Lean Impact: How to Innovate for Radically Greater Social Good is going to be an amazing resource for so many people from innovators to funders and everyone in between. 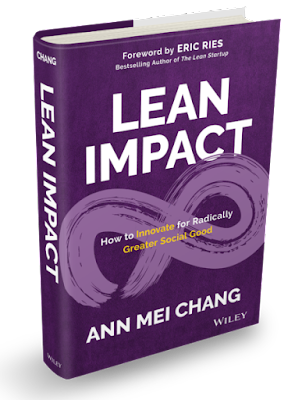 Ann Mei recently talked with me about the book, some of the structural problems that impede social innovation, how lean approaches are leading to better solutions, and how she came to Lean Impact. It was incredibly energizing! Let’s talk about what the idea of lean impact is and how you came to it. It’s such an inspiring story of taking skills from one sector to another for social good. I spent most of my career in Silicon Valley in the tech industry, about 23 years. Then about seven years ago, I decided to make a pivot to spend the second half of my career in the public or social sector, particularly focused on global poverty. I ended up doing a fellowship at the State Department, then I worked at a non-profit called Mercy Corps. After that, I served at USAID as the Chief Innovation Officer and the Executive Director for the U.S. Global Development Lab. It was really a dream job. Our charter was to identify breakthrough innovations that could really bend the curve of progress and also transform the way we the practice of global development itself. We worked on issues around global health, around economic development, around democracy and governance, around agriculture and access to energy--across the board and around the world. I became really inspired at the possibilities of taking some of the best practices for innovation that I learned throughout my career in Silicon Valley and applying them to solving some of the worlds' toughest problems. What are some of the biggest issues with the way projects happen in the social sector that prevents those problems from being attacked in an effective way? The traditional approach to global development, and much of the social sector, is to run fairly large size programs that are usually designed in detail upfront, then executed accordingly - something I call an enforced waterfall model. It’s very risk-averse. A foundation or government agency puts out an RFP, and non-profits or contractors then submit a detailed proposal. Then once an award is given, the grantee is expected to spend the next three to five years dutifully implementing on the program as designed. There's very little room for experimentation, for risk taking, for iteration. You have to stick to the letter of the proposal. That's not a great way to innovate. At the Global Development Lab we were pioneering some different ways to tackle problems, to structure our funding so that we could give out smaller grants for people to experiment, give them a lot more flexibility to do so, and then give them increased grants based on their successes. This happened both through development innovation ventures--we called these DIV--which was an open innovation window where we took ideas from anywhere and across sectors, and also through our grand challenges, which we called directed innovation. Those would focus on specific problems where we felt like the solutions we had were insufficient and we were seeking to tap into the worlds' greatest minds to come up with better solutions that could move the needle. You’ve now spent the last year writing a book about all of this, also called Lean Impact. Can you talk a little about why you wanted to do it in that format and about the process? When I left USAID, I wanted to continue to take the things I’d done there forward, and a book seemed like the right way to do it. I think a book is a really helpful reference point that anyone can access, whereas only a limited number of people can make it to any individual conference or presentation. We’re also doing events and conferences, either in conjunction with the lean startup community or potentially some independent ones as well, along with workshops and consulting services, all with a nonprofit mindset of looking at how we can help the social sector as a whole become more innovative. A book is a way to capture all the ideas in one place that can serve as a foundation. The intent of the book is to lay out how we can adapt the same approaches that we've seen lean startup bring to accelerating innovation in business to solving some of the world’s greatest problems. Yet, innovation is far more challenging in the social sector, and doesn’t always easily translate. Lean Impact addresses these unique barriers head on, and shares compelling examples from different organizations who have overcome them. I talked to over 200 organizations in the course of my research for the book, and it’s been really inspiring to hear their stories of how they managed to innovate in the work that they do. Were there any universal challenges among all the stories? Absolutely. One of the biggest ones is funding. Startup companies are typically funded by venture capitalist or angel funding that is fairly flexible; you can experiment, you can take risks, and it’s expected, in a sense, when you're a startup company. For organizations in the social sector, the funding that you get from government agencies, from philanthropists, and from foundations is often fairly restricted and fairly risk averse, as I was saying. It's a real challenge and this is the most common concern that I heard from the people I've spoken with. They wanted to innovate, they wanted to experiment, they wanted to take risks. But the way that they were funded, they felt like their hands were tied behind their back and they didn't have a lot of room to do it. That's one of the things that the book really focuses on: how to make the room, how to be able to do this type of work within the constraints that organizations often have. Are there some solutions you’ve seen work even for organizations that are in the early stages of adopting lean methods? I do think there are a lot of things organizations can do, even in the current landscape. It does involve taking some risk. One tactic is that some of the best organizations I spoke with have actually turned down grants that are too restrictive or poorly aligned. It's something that people are often hesitant to do, because they are trying to keep the doors open and they're trying to grow. It's very tempting to take money when it's offered to you. But some of the most successful organizations I know of were picky. They made the difficult choice to turn down money that was offered to them because it didn't allow them to move forward on the things that they thought would be most effective. They took a gamble that they could find other money that would be more flexible and many have. Sometimes it's just making that tough choice and really being patient to find the right kind of funding. The other problem I would say is that because of how the social sector is structured, we often have a mindset that everything needs to be done fairly big. We create these proposals, we run these big programs. Innovation in general and particularly with lean approaches, should start small. Experimentation isn't something that takes a lot of money. That’s more of a mindset shift: even if we don't have a lot of flexibility, we should take what flexibility we have and for example, just get out of the building. Go talk to your customers. Spending a day doing that can glean enormous insights, even if you're not able to completely transform the way you work. Injecting what you can by running a few small experiments or talking to customers can make a big difference. What would you say to people who might say that starting small is a little pointless when facing such huge problems? There's this great graph that the World Bank put out in a report a few years back that really shows the progress that we've made on some traditional poverty alleviation intervention, such as clean water, access to electricity, access to education, and so forth. What we've seen is very slow but steady progress. But if you overlay that with the trajectory of adoption of mobile phones, for example, you see a completely different curve where there's an acceleration of adoption that rapidly eclipses all of those traditional problems. Mobile phones were this new innovation that people wanted, that solved real problems for them, and that had a business model that enabled rapid scaling. I think it's absolutely possible to bend the curve of progress when it comes to global poverty. What it means is rather than brute forcing our way there--by taking the tried and true things we've been doing for decades and needing another dollar to reach another person--we need to step back and look at how can we find more effective interventions that get us greater bang for buck. We need solutions that people really want and embrace and we need to look at different ways we might go about solving some of these problems and finding one that has the capacity to reach much greater scale and impact in what we are doing today. That’s exactly what small experiments are for. Who can make that happen? Is it up to funders? Or the people getting the grant money? I'd love to see funders take a different stance in terms of how they give out grants and the kind of flexibility they offer, to really shift the way they fund to better support innovation in the industry. But I think grantees can help with that shift. One of the things that I've been a big advocate for is building in an innovation window when you apply for a grant. It may very well be the case that your funders out there are going to fund a certain way, so you need to write a proposal to access that funding. But you can include in that proposal, say, a 5% innovation window, where you say I'm going to use 5% of those funds to experiment in order to try to figure out how I can make the other 95% far more cost effective or impactful or scalable. It's a very good use of money. When you show that experimentation does really yield results, then hopefully the funder might consider even larger windows in the future. It's not necessarily what funders are thinking, but by taking some of that risk, I think the reward can be really outsized in terms of what they can deliver in the long run. It’s pretty clear these issues really need to be addressed from a lot of different angles at once. Can you talk about how lean impact fits into that? In the social sector, it takes a whole ecosystem to get projects done. In business, the individual business can do a lot on their own: You create a great product, you can go out and there's infrastructure to market that product, to take payments for the product, to be able to distribute the product and so forth. In the social sector, one non-profit, one social enterprise often can't solve the problem completely on their own. They need to work with donors, other partners, government policy, distributors, missing infrastructure. Just getting payments or getting distribution for products can be a big challenge. It ends up being a much more complicated problem that involves bringing together multiple players, multiple stakeholders that can really tackle the problem from different angles. So this concept of lean impact is for all of those stakeholders as well as the philanthropists, foundations, or government agencies distributing foreign aid. It can also be for individuals who are looking at how they can most effectively volunteer their time or make donations of their money to be able to create social change in the areas that they care about. What stage would you say social sector innovation is in, overall? And what’s needed, besides just spreading the word and the methods, to help it grow? Innovation has become probably the most overused buzzword in the English language. In the social sector, there has been a lot of interest because people are seeing the kinds of results that innovation is having in business, and they see an opportunity to make better, faster progress on intractable social issues. However, in many cases, I think there has been a misunderstanding of innovation--which has resulted in lots of new ideas being generated for social good, but very few of those ideas are reaching significant impact at significant scale. One of my favorite quotes is from Thomas Edison, who said that genius is 1% inspiration, and 99% perspiration. That inspiration is the invention, the new idea, which we absolutely need to get started. Lean impact is about that 99%, which is the blood, sweat and tears that goes into the constant testing, iteration, experimentation and feedback loops that take a germ of a great idea, and turn it into a solution that really can reach massive impact at scale. Ultimately the reason to become more innovative is to become more effective, and make a bigger difference more quickly for more people.